According to the Environmental Protection Agency’s (EPA) own estimates, its proposed power plant regulation could eliminate one-fifth of existing coal generation facilities and 80,000 energy jobs. The regulation, set for final publication this summer, would regulate emissions at existing coal and natural gas power plants, while also ensuring that consumers use less energy from coal facilities. 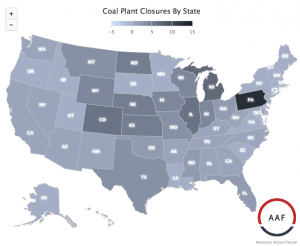 – Based on American Action Forum (AAF) research, this means that more than 90 coal-fired power plants could be retired across the country. Here is how this affects the economy: To put the figure of 296,000 lost jobs in context, the average annual pay in the “fossil fuel electric power generation” industry is $103,645 and the average coal mining salary is $82,068. This means that by 2030, the economy could lose $27.7 billion in wages, larger than the GDP of Jamaica. – EPA predicts that if states adopt only options one and two of the administration’s plan for power plants, 80,000 energy industry jobs will be lost to EPA climate regulations. However, EPA never quantifies the secondary employment effects of these lost jobs. A 2009 PricewaterhouseCoopers study found that one energy job supports 3.7 additional jobs. Using a jobs multiplier of 3.7, applied to the 80,000 lost jobs that EPA concedes, yields about 296,000 lost jobs across the United States. Professors Jonathan Masur and Eric Posner of the University of Chicago have devised a central figure of the costs of a lost job: $100,000. Using this data point, the broader economic implications of 296,000 lost jobs become bleak. The employment costs could eclipse $29.6 billion. That figure alone would make it one of the costliest regulations of all time, but it is absent from EPA’s RIA because agencies typically refuse to incorporate employment projections with regulatory analysis.